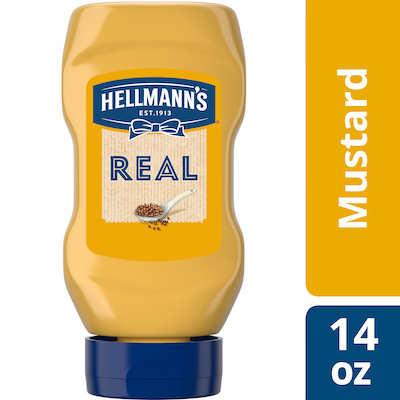 Hellmann’s Real Ketchup & Real Yellow Mustard have simple ingredients guests can trust. New Hellmann’s Real Ketchup & Yellow Mustard: Simple ingredients & no high fructose corn syrup. Water, white distilled vinegar, mustard seed, salt, turmeric, paprika, spice, sugar. Hellmann’s Real Yellow Mustard Squeeze Bottles allow your guests to easily add delicious yellow mustard to their favorite menu items. This yellow mustard is made with real, simple ingredients that your guests can trust, and contains no artificial colors, flavors, or preservatives. With its creamy texture and mild kick, it is perfect for enhancing burgers, sandwich spread condiments, side dishes, and other menu items. And thanks to the convenient upside-down design, this mustard squeeze bottle allows guests to easily dispense the mustard while minimizing mess and waste--making it ideal for restaurants, cafes, hotels, and catering services. Easy squeeze bottles in bulk ideal for cafes, restaurants, hotels, and more. If safety seal is missing, do not use. Shake well before using. Do not refill.